Free Download StationPlaylist Creator 5.0 - Music and spot scheduler for radio and more. StationPlaylist Creator is a capable music and spot scheduler for radio stations (both online and traditional ones) and automated music systems in bars and stores. It may also be used to create playlists containing video files. To generate your first playlist, you will need to create it in the Category tab and define the folders where your music files are stored. You may categorize your files by genre, tempo, theme, etc. to have more control over your playlist. In the Spot Group tab you can define files and folders which contain station ID's, jingles, and ads. In the next step you will create a rotation by selecting music categories in the order desired for one hour of scheduling. You should create different rotations if different programs or different styles of music are wanted at different time of the day. In the last but one step, create a schedule that that will select rotations to be used at different times of the day and/or days of the week. Now you are ready to generate a set of playlist files, one for each hour, which will contain the list of tracks to be played in your broadcast playback automation system. The filename format of the customized playlist is compatible with many playback systems including both free software audio players (Winamp or Windows Media Player) and professional broadcasting software. 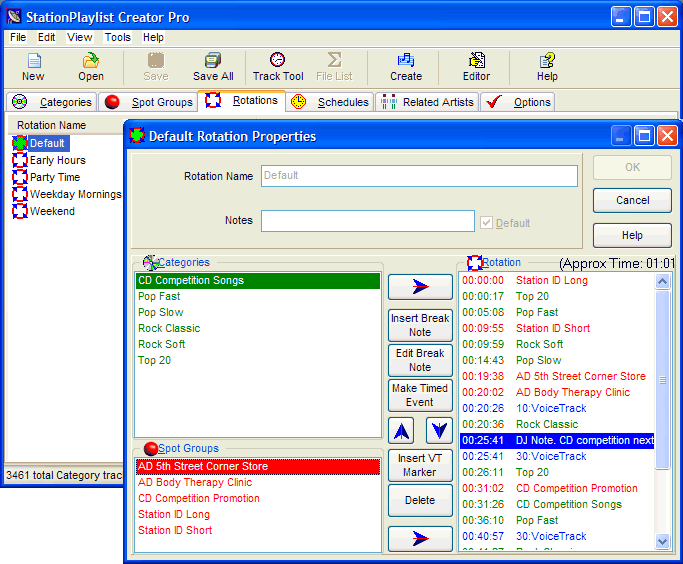 The tool contains an integrated Playlist Editor to edit (move, insert and delete tracks) your playlists, with advanced search and replace functions and an option for printing. Another useful integrated utility is the scheduler to start your playlists at exactly the right time every hour or every day and to create new playlists automatically. The Playlist Creator is offered in 3 editions: Lite, Standard and Pro. They support a different number of categories and spot groups and contain various advanced features (Voice Tracking System, Traffic/Billing log file import, personalized HTML playlists). Download and check the free trial right now! I have been using StationPlaylist creator + studio for several months. I have 100% no issues with the version I paid for, and probably would pay quadriple for it - its that good. Playlist Creator and Station Playlist does everything necessary and more...EXCELLENT value for the money.